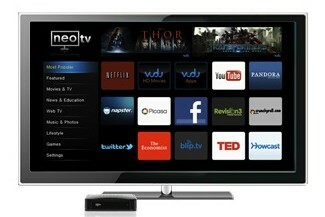 Netgear is evaluating the use of Google TV for future digital living room products, according to a report from Slashgear. A company spokesperson told the website that as a platform its not there yet. However, that wont stop Netgear from taking a closer look at the TV operating system, especially now that the release of a big update based on Honeycomb and access to the Android Market is imminent. The router maker is now trying to corner the market for media players under $100 with its own product dubbed NeoTV, which offers access to some 100 content sources, including Netflix and VUDU. So why is Netgear looking at Google TV despite having just built its own platform? Access to the Android Market could be a boon for anyone releasing products for this market, and a built-in web browser will give users access to a wide range of additional content. However, embracing Google TV is not without risks. Logitech recently had to write off millions after its Google TVpowered Logitech Revue set-top box sold far below expectations. The company is now selling the product below cost for $99. Netgear would probably want to wait until bigger players like Samsung and Vizio have rolled out their Google TV products to avoid a similar fate as Logitechs.